Pistachios or cashews, ghee, wheat flour, sugar, corn starch. Bird’s Nest is a very light dessert. It is so light, one can eat a few dozen pieces before noticing. It is the lightest among all Middle Eastern sweets and pastries. In Arabic, Bird’s Nest is called Osh El Bulbul and pronounced [ush-el-bul-bul],. Its circular shape and filamentary structure resemble closely that of a bird’s nest. How is Bird’s Nest Made? To make Bird’s Nest, first the stringy Knafeh dough and the sugar syrup are prepared, then the dough is formed into circular shapes resembling bird’s nests, filled with nuts, and baked. 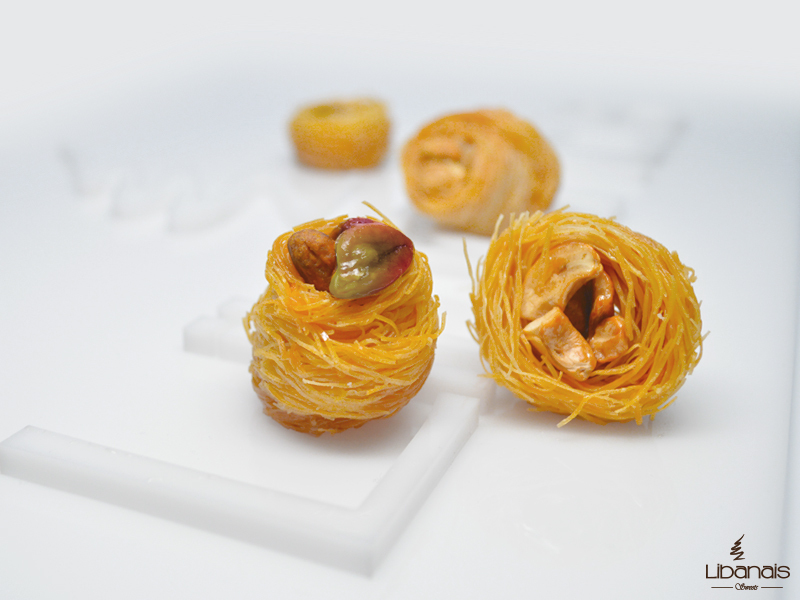 For each Bird’s Nest piece, a few strings of the freshly made Knafeh dough are formed into a circular shape resembling a bird’s nest and filled with pistachios or Cashews. The bird’s nest shaped pieces are the left to dry for about 12 hours. Ghee is added on top of the Bird’s Nest pieces which are then baked for one hour on medium temperature. After baking, the remaining ghee is drained and sugar syrup is added. Bird’s Nest is offered as a dessert. It is however so light and so small in size, make sure you offer at least a dozen pieces for each person. It is most popular in Syria. It is also popular in Lebanon, Palestine, and Jordan. It is one of the assorted Baklava pastries that are made with knafeh dough. Assorted baklava pastries are made of two forms of dough: Paper thin sheets of phyllo dough and thin strings of dough called knafeh dough. While many types require the knafeh strings of dough to be shredded, Bird’s Nest takes advantage of the stringy shape of the dough to give it a unique texture.